We assume why we do what we do. But how do you explain when things don’t go as we assume. Or better yet, how do you explain how do others seem to achieve things that defy all assumptions? How could Apple (during its peak) be more innovative than all other computer technology companies which had access to the same agencies, media, talent, and market conditions? How could the Wright brothers build the first successful airplane when there were better teams with better networks and larger budgets? There is something else at play here. And hopefully, this post can change the view on how you think the world works and how you operate in it. There is a pattern. All inspiring leaders and organizations in the world think, act and communicate the exact same way. And it’s the complete opposite as someone else. 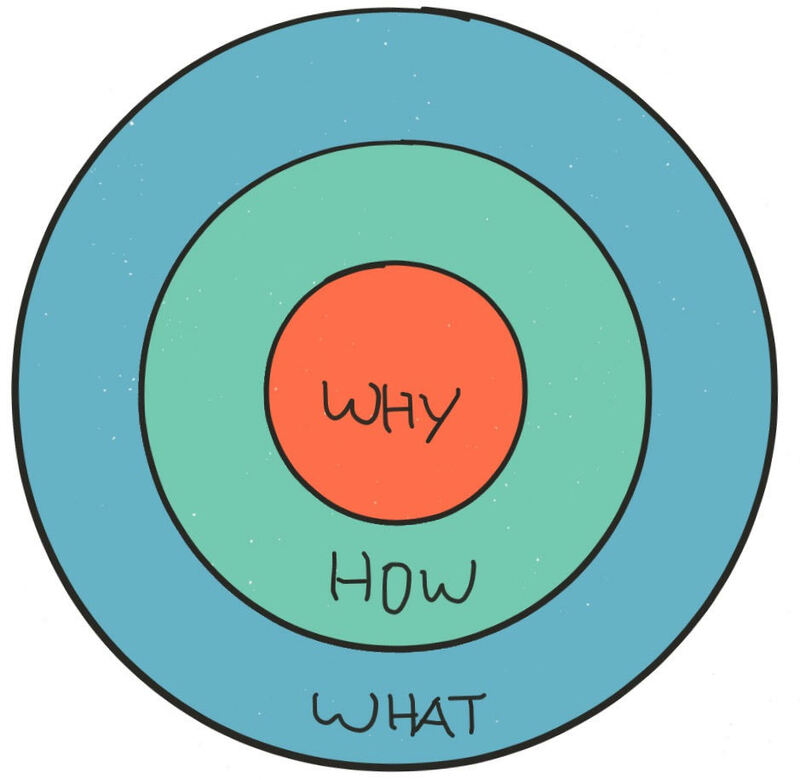 Why: This is the core belief of the business, it is the purpose…it’s why the business exists. Very few know why they do what they do. How: This is how the business fulfills that core belief. Some know how they do it…whether that is the value proposition, proprietary process, etc. What: Every organization knows what they do. This is what the company does to fulfill that core belief. We make great computers, they are beautifully designed, and user friendly…wanna buy one? This is the way most marketing messages are crafted. We say what we do, how we are different and we expect some kind of behavior. Everything we do we believe in challenging the status quo. We believe in thinking differently. The way we challenge the status quo is by making out products beautifully designed, simple to use, and user friendly. We just happen to make great computers…wanna buy one? The only difference between message one and two was the order in which the information was released. People, don’t buy what you do, they buy why you do it. This is why 14% of the world is perfectly comfortable buying a computer from Apple. But this also explains why people are also perfectly comfortable from buying an iPhone, iPad, and iWatch from Apple. Apple’s competitors are perfectly qualified to make and sell all of the above products. And they have attempted to do so, yet nobody bought one…nobody cared. Dell can make beautifully designed products, but nobody can imagine buying a smartwatch from Dell; a ‘computer company’. But we do it every day! People don’t buy what you do people buy why you do it. You can give somebody all the facts and figures but they still think it doesn’t feel right. The same logic applies when it comes to attracting top-notch talent. The goal is not to hire people who need a job (that is the what) the goal is to hire someone who believe what you believe (focus on the why). The person you hire because they can do the job will work for money, but when you hire for values/culture, they work for the organization with their blood sweat and tears. Wether you are an early stage founder, a recruiter at a Fortune 100 company, or a marketer like me, and you are wondering how to make people care, remember that people don’t buy what you do, they buy why you do it. Start communicating from the inside out. Purpose generates emotions, and emotions inspire actions.